I started painting again, and this one was done last night. The three gizmo in the painting remind me "Three Stooges". I maybe too young and too foreign to know those fun jokes, but I learned about them about 15 years ago. That time I was working with two other engineers on a new machine which was designed poorly. We worked really hard, but couldn't get the job done. One said: "Oh! boy, we are working like three stooges". That was the first time I heard about those funny guys. I have just completed my week long engineering project and come back to art. Since I have no painting to share today, I would like to show you something else. This is a pencil drawing, not by me though. Can you tell who did this. Right, some of you can figure it out. It was done by my dear wife, Song. She took a drawing class at the local Gemini School of Visual Art. Her teacher was a wonderful artist and a very good friend of mine. His name is Denny Grant. She spent about 24 hours in 6 sessions on this drawing. I was amazed by her value control and subtle details she depicted. Danny's class follows the traditional academic approach. I highly recommend that all painters should do at least one of this kind of drawing. It helps tremendously on your sensitivity of shapes and value. I did this 12"x16" last weekend. I was very happy for being invited as a guest artist to participate in the Putney Painter Exhibition at Legacy Gallery in Scottsdale, AZ in January 2012. This painting will be one of my entries. Richard Schmid will determine which one will be in the show. I put a lemon a tomato, a cherry and two radishes together. With some spice leaves, I think they will make a good Chop-suey. Well, I don't know if it taste good, but they look good on the painting. After being full time in art for a month. I have been called back by my engineering company for an emergency. I will work here for a week. I may not paint much at this time. Sitting at my cube and turning on my old computer, I felt really odd. It seems I came back from the future by a time machine. For engineering, I entered this field so naively. I thought I could build a career here. I thought I would create something to make the world a better place. So I have invested so many years of my life getting educated to the highest level, and I have been a very good engineer. However after many years of hard work, I have learned. I feel disappointed about the corporation culture. I am wondering how many people in industries are really interested in making the world a better place. It is so ironic. Now I feel more that the world was used to be a better place. Looking at the people around me, busy and “working”. I better not disturb “the sound of silence”. After I painted together with Richard Schmid, we had a long talk. He asked me why I paint apples and bottles. He wants me to think more how much of "me" I want to share through my art. Well, my today's painting does have that kind of info. I have this Tibetan payer wheel for many years. To be honest with you, I don't understand much of the Tibetan Buddhism, but I am very curious about what have been taught in that mysterious place. On the prayer wheel, I see six Tibetan words. I googled them and know they are pronounced: "OM MA NI PAD ME HUM" It is a mantra, and it can not be translated literately. So I don't understand the mantra means. However, I like the "wheel" idea. It is turning, repeating. That is the characteristics of our world and our life. We see days and nights. We experience seasons. We know we live on a globe. With advanced technology, we learned the solar system. We learned the spinning galaxies. We know the vibrating atoms. We know colors of light have different frequencies. We know complicated organic systems are based on repetition of simpler chemical structures. Mathematically, we can model the world with something called the "Fourier Transform"...... We are on the "wheel". To be more accurate, we are part of the "wheel". However nowadays, very few people have time to care if we are "turning" or not. Our mantra is: "Oh! MONEY buy me home". Strawberries are on sale in our local grocery. We got a whole bunch. I think I painted strawberries before, but I don't remember when. So I did a small one last night. I really enjoyed. I don't know why I haven't paint strawberries more often. I think I will in the future. Creating darkest dark was what I was working on with this painting. To get the best result, I feel I need enough "tooth" on the painting surface. High absorptive surfaces work better. I was using Alizarin plus Phthalo Blue for the bottle at the back. After I came back from Vermont, I haven't got much chance to paint. I did this small painting this morning to warm up. I start to pay attention on the colors in shadows. This is another area I can improve. 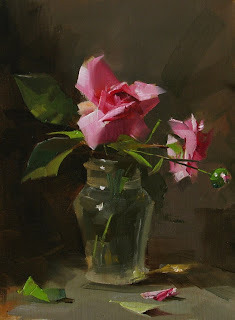 "Demo together with Richard Schmid"
On the fourth day of the workshop, The master painter Richard Schmid came. We demoed together in front of quite a crowd. Richard brought many pots of lilies with vibrant yellow and oranges and made a very magnificent and elaborate floral still life setup. I have never painted in front of such complicated setup, but I had no way out. Richard is such a wonderful teacher. I have learned a lot. He made everybody laugh with jokes. He has asked me if I have any Chinese jokes to tell. I was so nervous to say anything. Any way I think I did OK. When we began the demo, Richard had challenged me on who could finish the painting faster. I won that competition easily. I did a much smaller painting. The second demo I did at Putney is here. There are many apple trees outside the studio. They were still small and green, but they were good to paint. So I got some leaves with small apples and set up my second demo. I also used lighter background to make this painting a high key one. Recently, I did more high key paintings like this one, but to be honest with you, I still like the low key painting better, because I can have the center of focus in light to create a glowing spot. However for a high key painting, the center of focus is usually has darker value than the background, so it will not as shining as its low key counterpart. However, the beauty of the high key painting is the color opportunities in shadows. I can see that I am not there yet, because I still use relatively dull colors in my casting shadows. 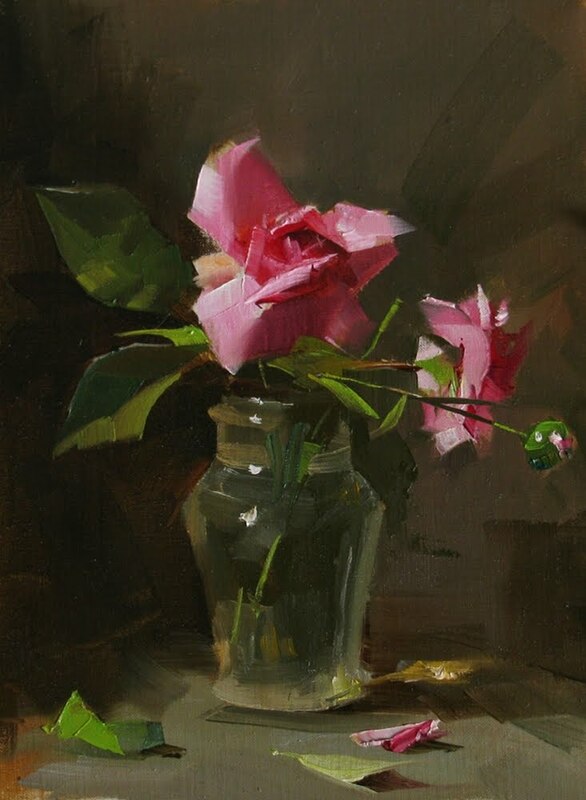 Similarly in your painting practice, you should congratulate to yourself if you see problems in your painting, because you have caught the problem, it is no longer hiding, so you are half way to success already. Now, I am showing you paintings I did on the Putney workshop. This is the demo I did at the day one. It is very typical setup of my still life composition. I like to discuss the ideas behind the painting at first day of my workshops. If you have taken my workshop before, this is your quiz: what have we talked at the first day? Can you see the designs we have talked about on this painting? This painting didn't get sold. I took it home and showed to Song. She really likes it. So I decided to keep it for her. I am at the airport waiting for my flight going back to Austin. Recalling those days in Putney Vermont. Everything was so phenomenal. My today’s painting is another small one I did before my workshop started. Those roses were from Captain John’s garden. It is a different specie of rose I haven’t ever had before. I was stunned by its beauty. I used to get roses to paint from Walmart you know. Just like these roses, Vermont is very different from other part of the united states. When I was driving on Interstate 91, I did not see any advertising billboards. I heard there are no Walmart, Home Depot, and many other major chained stores in Vermont. In Putney, I saw bicycles you can get for a free ride and drop them at different locations after your trip. People go to those non-profit Co-ops to get their everyday stuff. Even they have their local currency. I saw beautiful farms and lovely gardens. People are so down to earth no matter they are rich or poor. I met a barefooted musician who plays beautiful jazz at the local farmers market. He used to be a medical doctor and now full time in music. I saw art all over the place. At the Putney community supper, I met people in this village given puppet shows and circus. With rustic red burns and old houses, Vermont is such a unique place. Hello my friends. I have just finished my workshop at Putney Vermont yesterday. It was so wonderful. I want to thank The Art Village of Vermont, Penelope, and Captain John for organizing. I am so honored to be with the master painters Richard Schmid and Nancy Guzik. (I will report more on this event later). Thank you so much for all workshop artists coming from near and far. I hope those several days will be useful for you. I surely had a great time with all of you, and hope to see you again, either at workshops, shows, or other activities. 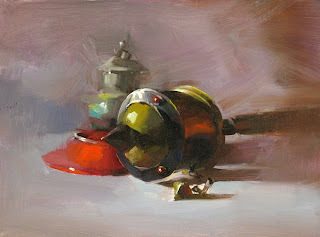 This small painting I did here before the workshop to test my setup and lighting. I felt very happy with this one. I like the translucent light in the shadow a lot. I am in Putney, VT staying with the beloved Penelope and Captain John. They are the wonderful organizers for my workshop here. If you study art of Richard Schmid through his DVDs, Captain John should be no stranger to you. Richard has introduced his approach of portrait painting through the demonstration of painting Captain John. Penelope and John are in charge of the Putney painter's group. When I met them last year, I had felt I have known them for a long time. I want thank their warm hospitality, and I feel very comfortable here. Today is the first day of my workshop. The group of artists we are having fun together are coming from all over the world. Hawaii, Shanghai, Southern California, and North Carolina are just a few places they are from. I feel so grateful they are here with me. I will share paintings I did at the workshop soon with you. This plain looking barn is the place where the master painter Richard Schmid and his Putney painters group paint together. I am so fortunate coming here and giving my workshop. I want to thank the wonderful Penelope and Captain John for their hospitality. I will spend a very important week in this legendary place. I am very happy. I have reached my art Mecca. I have several tomato plants in the back yard, and they have given us many tomatoes. However, I have not taken care of them well. Now they have all dried up. This morning I cut a section of the dry stem for my setup. Like leaves, painting stems is my next practice I want to manage. I have spent quite a long time just on that piece of stem. There has been a lot of knife work and negative space cutting. It is not perfect, but it is a good start. Many friends have given me tips on fast dry medium. Thank you so much. I will try your suggestions, and find the one most suitable to me. I will share with you when I decide. Next week, I will go to Putney Vermont. This will be my first time work together with THE Master Painter Richard Schmid. We will do a painting demo together. Please check Richard Schmid's website and see the event in July. It a great honor for me, and I am very excited about this trip. I will be very nervous for sure, but I will try my best.